I was unable to post them in my intro on the main forum earlier due to Photobucket playing up. Seems ok now, so here we go - a selection of some of my military issued watches owned over the years (most long gone). Some crackers in there, Chris. I love to see the issued Tudors, but the one(s) that most fascinate me are the PD Bunds. Before I bought just about any watches I remember spending ages staring at one of these on a site that had a couple of PD including a Bund for sale. They are just so cool IMHO. What are they like in the metal? Chris you got some nice one's in your collection.can you tell us a little more on the Tudor you just don't see tomany of them.The only time I evere saw some on a forum was a post at the MWR forum were some one went to a seal reunion in San Diego and he took photo's of every body's wrist never seen so many Olongapo Bracelet's and Tudor's and Rolex's in one place he did not take any shot's of the back cover's your's is the first I ever seen with military marking on the back. Last edited by river rat; 21-07-2010 at 23:28. Nice to see you here Chris - lovely set there. Some info on the Tudor would be great. I like the Olipangu (sp??)! Ok chaps - The Tudor was acquired by a fellow collector from an antique shop in Paris after it's American owner had done a trade on a piece of fine art. He bought it from the dealer and began to do some research on it's history. He eventually tracked down the family of the Seal who had been originally issued with the watch and met with a frosty reception when he made contact (not sure why but he assures me it was not pleasant). I bought the watch from my collector friend shortly after. Really great watch that unfortunately I was not happy to use as a daily wear - the case back has some fine cracks on it towards the outer edges so the ability to withstand getting wet was of concern. Eric regretted selling it and after some negotiation I let him take the watch back into his care and I became the owner of the IWC Bund in the pictures I posted. The Ocean Bund is still hanging around and gets regular wear, especially in summer months. Some very desirable watches there, Chris. Which ones do you still own? (Looking forward to seeing the survivors at the next GTG). All nice watches, but the IWC gets my vote. That's one you don't see very often! I love the velcro on that watch. In fact, velcros are my favourite. My wife told me that it's really easy to spot a WIS: man or woman with an expensive watch on a very cheap-looking strap... I think she's right. My Auricoste looks exactly like yours: the crystal has some white marks on it. I sometimes consider having the crystal replaced, but on the other hand, it looks more 'used' this way. And talking about the Auricoste: I noticed the magazine on the background: there's something about Dutch marine divers. I would really like to know more about the article! 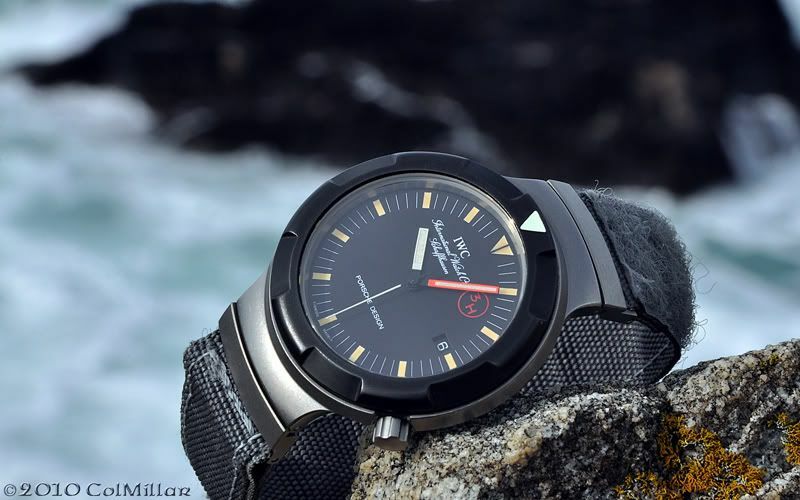 My latest diver is the EZM2. A really cool watch, I think. Most of the time, I'm not very fond of quartz watches, but with this watch, it's spot on: the oil inside and a mechanical movement don't work together!